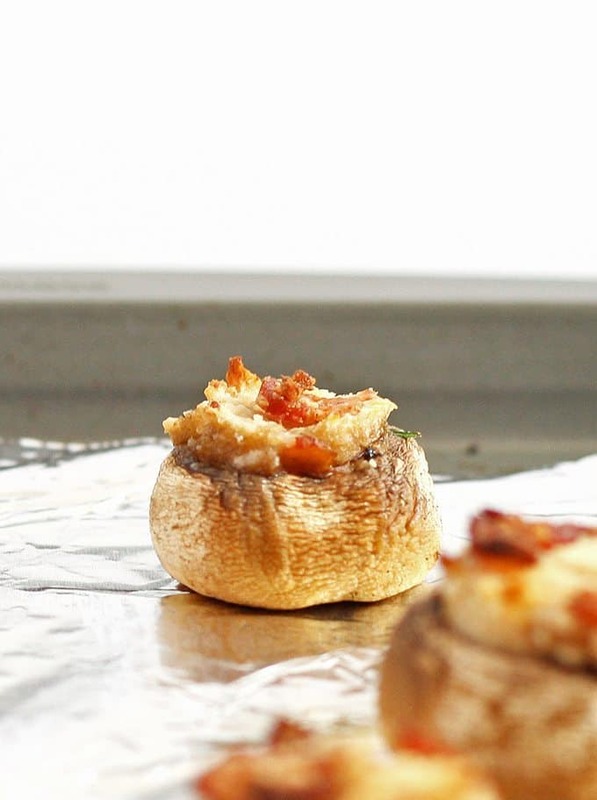 This easy stuffed mushroom appetizer is a perfect finger food! If you’re look for a warm app, make this – it’s quick and delicious! Do you remember last week when Mr. B went shopping for me and bought home 10 pounds of mushrooms? How could you forget… or rather how could I because I was the one with a truckload of mushrooms. Because really, that’s what you need to do when you have a ridiculous amount of mushrooms that you need to get rid of. I mean cook with. Besides the plethora of weird mushrooms Mr. B. picked up (oyster…shitake…crimini…) he also grabbed 2 pounds of common white mushrooms. While you may think this is a good thing, I took this as more of a challenge. They are so common that it hard to be creative with them. So I took the opposite approach and decided to go with something easy instead. 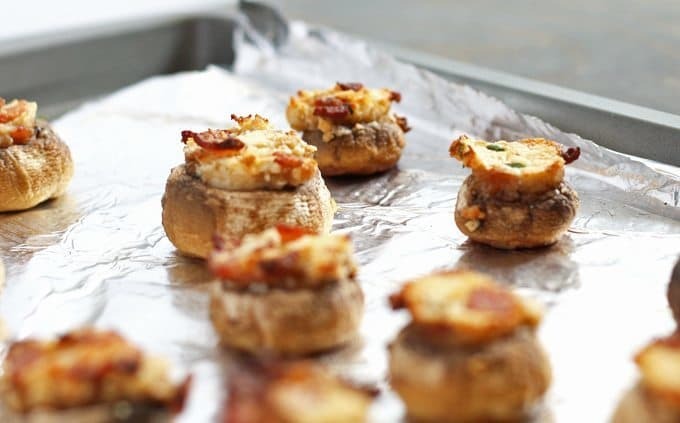 One of my favorite appetizers at weddings and dinner parties are stuffed mushrooms. You know which apps I’m talking about. When the catering servers walk around with those silver trays and their white gloves and I see a stuffed mushroom heading my way… it’s a happy day. I don’t know what is in those apps but its definitely something magical. In lieu of that magical ingredient list, I went with bacon. Everything is better with bacon I always say. 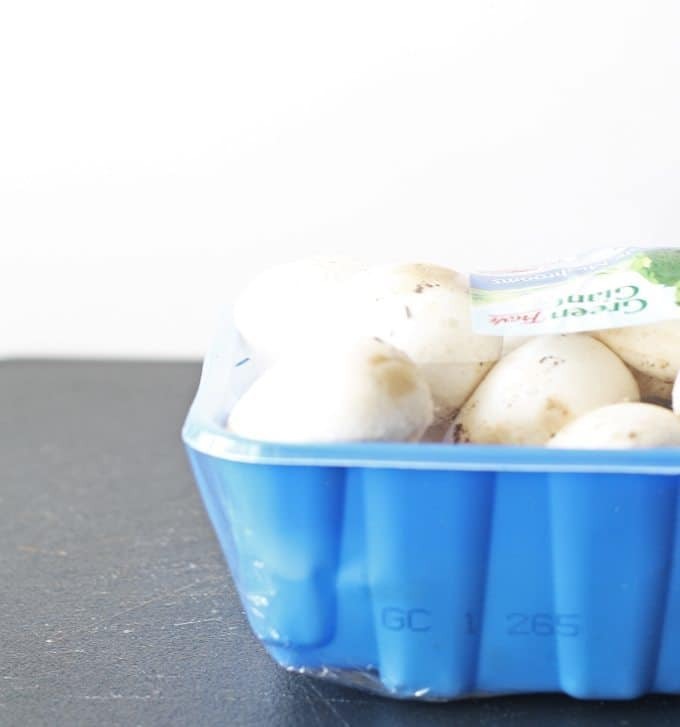 A little softened cream cheese and some chives later, and these little mushroom babies were created. Mr. B. left me a few and then ate them all. That, to me, means this recipe was a success. Combine bread crumbs, cream cheese, garlic, chives, bacon and 2 tablespoons olive oil in a small bowl with a spoon. Cover a baking sheet with foil and drizzle 1 tablespoon of olive oil on the foil. Spoon the filling into the mushrooms and place on the baking sheet. Drizzle the remaining oil on top of the filled mushrooms. Bake 20 minutes, until the filling is heated through and the tops are golden. Remove from oven and serve. Adapted from [url href=”http://www.foodnetwork.com/recipes/giada-de-laurentiis/stuffed-mushrooms-recipe.html” target=”_blank”]Food Network[/url]. I love stuffed mushrooms! Unfortunately for me, my youngest son is the only one here who likes mushrooms besides me, but I think I will make this as a special treat for the two of us! Thank you for the recipe! Pinning! If you have a moment, I’d love it if you’d stop by and share it at Foodie Fridays tomorrow night! You’re welcome Michelle! And I’ll be sure to share it there tomorrow! I’m so glad you came by!! I know I already pinned them, but I will stumble them too! They look so good! Thanks Michelle!! I appreciate it 🙂 So many great things are shared at FoodieFridays each week! I agree- everything is better with bacon! These look great by the way! 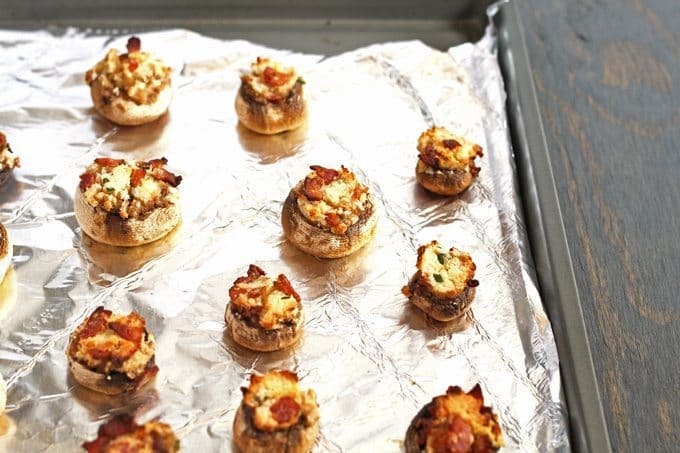 Definitely going to try this recipe as we love our bacon and our mushrooms! I’m definitely going to make these on Friday for my party! Yum Lalena, you’re guests are in for a treat! not a fan of mushrooms, but those look so good I’d actually try one. I never imagined that these could be easy to make! sweet! … or I mean… savory! I am having Thanksgiving at my house this year and this stuffed mushrooms are going to be a hit with the family. Ten pounds of mushroom? At least it cooks down and can be added to several dishes. I haven’t had stuffed mushrooms in quite a while. It sounds pretty good. I am a huge fan of stuffed mushrooms! And these sound delicious, I’m saving this recipe for the future! Thank you! These look delicious and easy! Great for an upcoming party I am going to! I love stuffed mushrooms, but haven’t made them i n a long time. I’m going to have to make these…. soon! YUM! These look and sound amazing, yum, I am pinning for later! I am a big fan of mushrooms, stuffing them takes it to a whole new level. 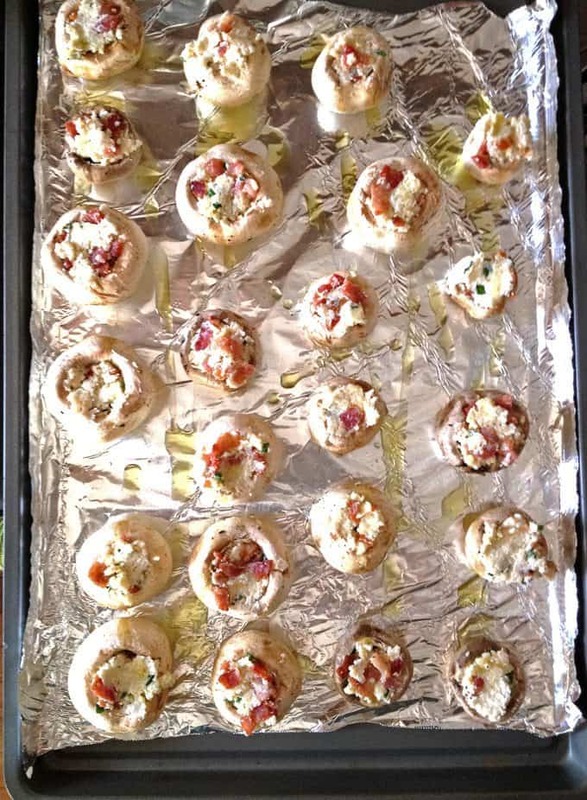 These would be so great as an appetizer for a holiday gathering. Thanks for joining us at Foodie Fridays. Hope to see you again this week. Delish and easy to make – right up my alley! Thanks! 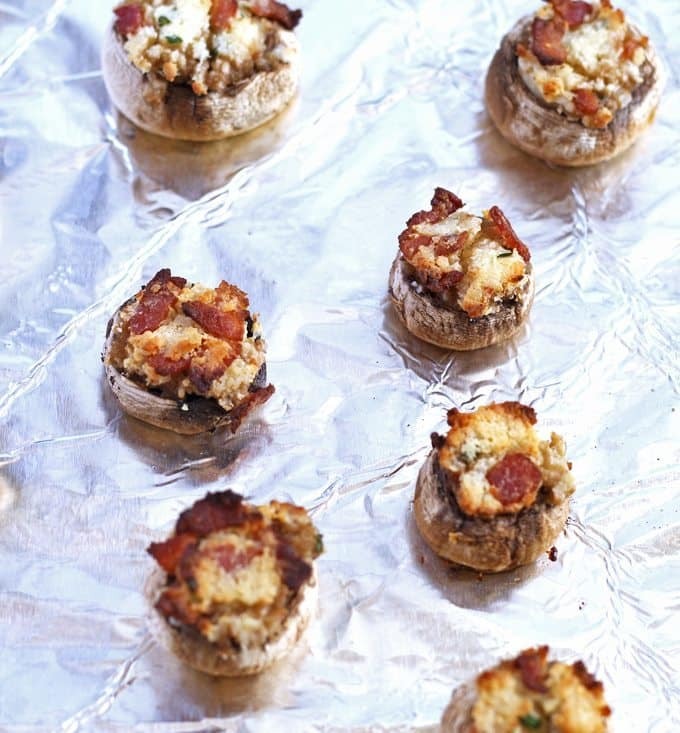 These stuffed mushrooms look really delicious, they would make great hors d’oeuvres. I cannot wait to give this a try., thank you for sharing this recipe.